I remember the first time we decided to drive half way around the country and back for our first trip to Disney World. With three children 6 and under, I knew it would be difficult, but I don’t think I fully realized how difficult it would be. I thought I knew how to survive a road trip with kids, but I learned so much during that adventure. Five people, three being children, in such a small space for such a long period of time isn’t for the faint of heart. Being on the road for 18 hours is hard on everyone, but I think even harder on our children. They haven’t learned how to keep themselves occupied so boredom kicks in fairly quickly. That’s where lots of planning comes in handy! Make them as comfortable as possible in the car. It’s likely they won’t like a cold vehicle like you do, so make sure you pack a blanket to help them stay warm. We all know how uncomfortable seat belts can be, but seat belt pads do provide some relief. Make sure your children are dressed in comfortable clothing. Try to stay away from fabrics such as lace as it can become uncomfortable after extended wear. You know your children better than anyone. You know the things that bring them comfort. If it’s safe to do in the car, do it. It might mean bringing more stuff, but having a car load of stuff is better than having screaming and crying kids. Bring enough snacks to feed an army of children. Seriously! I’m not sure where they put all those snacks in those little pint-sized bodies, but somehow they figure it out. When you think you’ve packed enough, pack some more. I like to pack snacks that aren’t messy and are easy to eat and store. Some examples of the snacks I pack are beef jerky, gummy fruit snacks, string cheese, etc. Just think foods that aren’t going to stain fingers or car seats, foods that can’t spill easily, and foods that keep them happy! 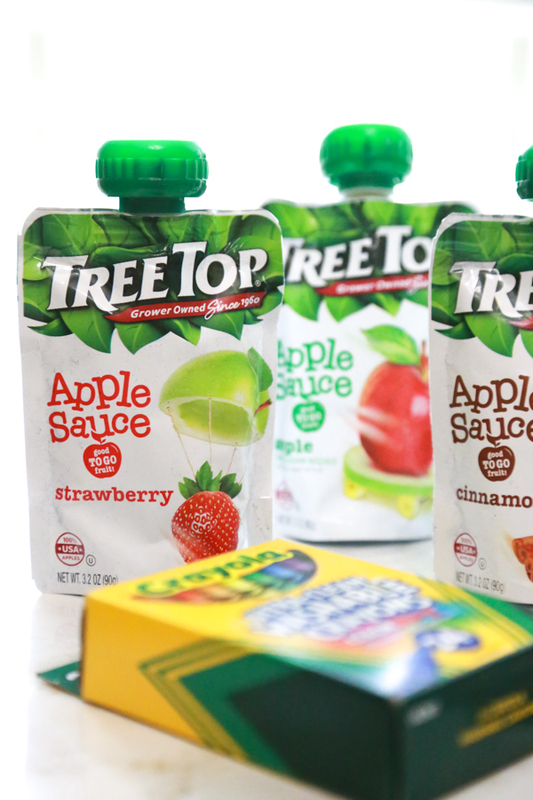 Another great packable option for road trips is Tree Top Apple Sauce Pouches. 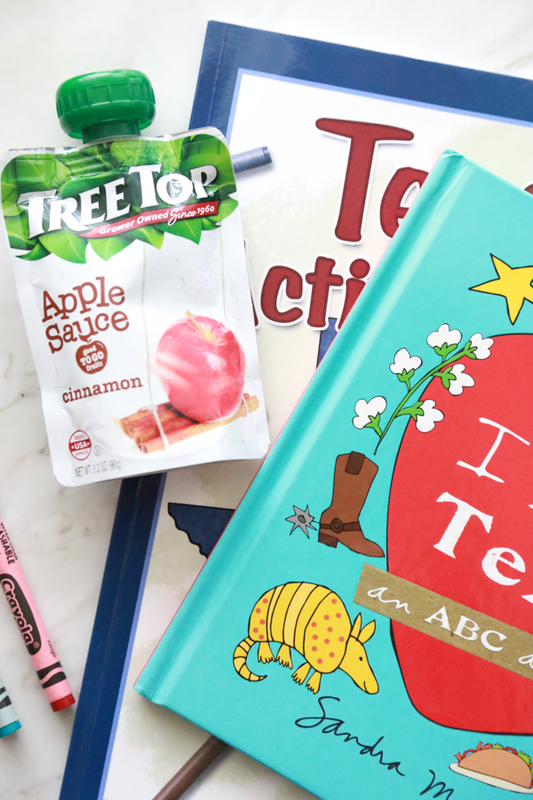 They are an anywhere, anytime, no mess snack made with 100% USA apples from growers’ local orchards, and contain nothing artificial. With the no spill squeeze pouch, it’s perfect for surviving a road tip with kids. Plus it’s such a convenient way for kids to enjoy applesauce on the go. Bring enough entertainment to keep them occupied throughout the ride. I’m a big fan of seeing the world around you, but sometimes relying on the digital babysitter isn’t that bad of an idea. If you have digital devices for your children, bring them. If you don’t, buy them. You’ll be amazed at how well the digital babysitter is at keeping their minds occupied on something other than the long car ride. Don’t forget the headphones! (If you don’t have any for the kids, at least bring some for yourself so that you don’t have to listen to them!) We also use old school things, like coloring books too. I print some free coloring pages and pack some crayons and colored pencils and we’re good to go. Another great idea is to print out some Road Trip Bingo cards. Throw in some reading time too. Pack some of their favorite books and read to them or have them read to you. Learning how to survive a road trip with kids is all about trial and error. During your first go round you probably won’t have everything just right. But with experience and planning, you’ll learn and adjust as needed. You’ll be roadtripping with kids like a pro in no time! What tip would you give a first-timer on how to survive a road trip with kids? I did a lot of back and forth road trips with my kiddos last year when living in two places. All these ideas would have been great for our 14-hour trips! I grew up in Cleveland, Ohio and my dad is from Philadelphia so we had lots of long road trips as kids. Without all of the technology available today we learned to sleep in the car, play games and enjoy the scenery. Now kids have so many more options. Bringing games to teach them about where they are going and letting them listen to music on their own devices helps with the problem of finding good radio stations in some areas. When we took our kids only 20 years ago, they learned to amuse themselves in a car. Great post. Wonderful tips! 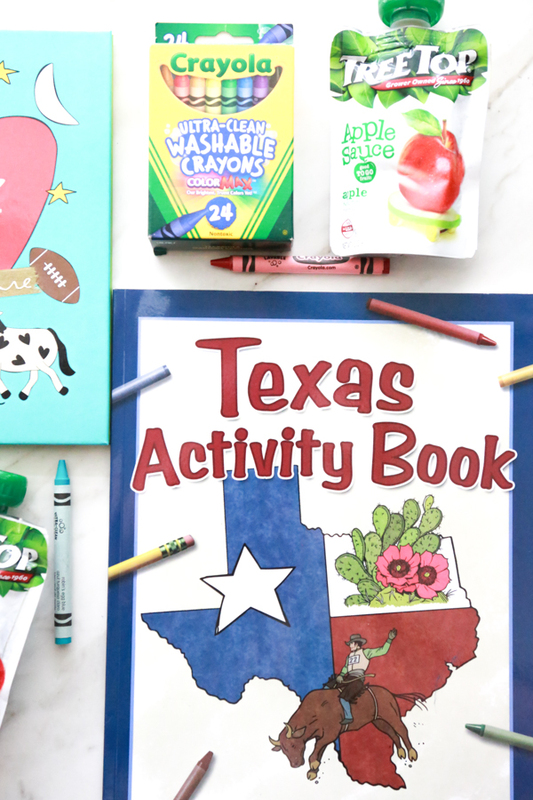 Snacks and activity books are a must for our road trips. I have done many a road trip with kids! Yes, yes, yes, to all these things! With my teenager, it is all about having charger outlets. He can not go without his music so we always have charging banks. You have really great tips! Snacks and entertainment are a definite must. These are musts for adults, too. These are all great tips. I remember road trips with the kids when they were young – boy, was it challenging to keep them entertained! These are all great tips. You’ve got to keep them busy and entertained so that they don’t fight! We love family road trips! These are some great tips! We always pack some small games, crayons, snacks. Apple sauce pouches are a must! So easy when on the go. These are all great tips! We do a lot of road trips in summer and snacks are a must! When in doubt give them something to eat. Also coloring books and stickers work great for little ones too.